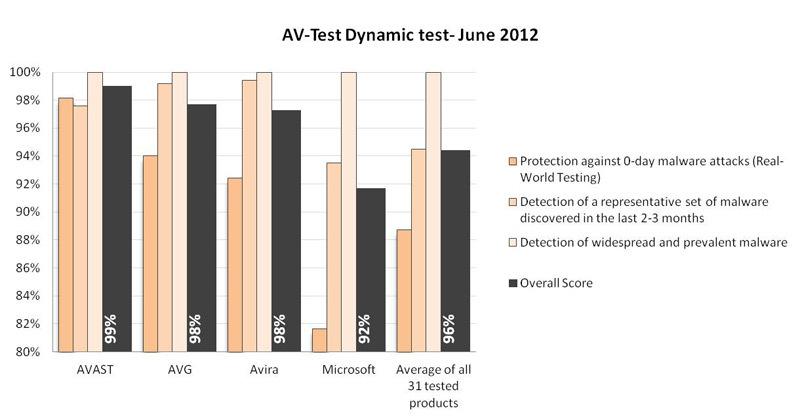 In the June 2012 Dynamic Test involved a total of thirty-one consumer and business internet security products covering a range of metrics, including protection against ‘real-world’ zero-day malware attacks, detection of a representative set of malware discovered in the last 2-3 months, false positive rates, and scanning speed. avast! Free Antivirus detected 100% of widespread and prevalent malware (such as viruses, worms or Trojan Horses), and its cumulative score earned it the top spot for overall performance among competitors.